Another one up, another one down. 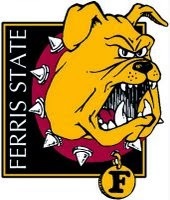 In what's been a familiar story with Ferris State in recent weeks, the Bulldogs have extended their winning streak to five games after a series sweep over fellow WCHA foe Bemidji State this past weekend. The No. 19 ranked Bulldogs nabbed a 5-4 decision in overtime on Friday, followed by a 5-3 win in the series finale to move into first place atop the WCHA standings. The Beavers' Phillip Marinaccio put the Beavers ahead in the series opener with an unassisted marker midway through the first period, only to be answered by freshman forward Chad McDonald a minute later. Both squads played tug-of-war over the scoreboard in the ensuing frame, with Ferris State grabbing their first lead of the contest on an Andy Huff goal at the 3:46 mark. A mere five minutes later, the Beavers knotted the score at two goals apiece with a power-play marker by Markus Gerbrandt. Bulldogs' forward Kyle Schempp scored while on the man-advantage to notch the fourth goal of his freshman campaign at 15:29, before Ruslan Pedlan of Bemidji State evened-up the score with 22 seconds left in the stanza. In the third period, Cory Ward snuck the puck past Ferris State netminder C.J. Motte with 6:25 elapsed to place the Beavers back on top, only to have junior forward Justin Buzzeo force the extra session on a game-tying goal four minutes later. The Bulldogs needed just 1:28 of overtime to finish the job, with Scott Czarnowczan and Schempp tallying helpers on Jason Binkley's game-winner. Motte finished with 22 saves, while Andrew Walsh collected 38 at the other end of the ice. Four first period goals were enough to power Ferris State en route to their second consecutive sweep, as freshman forward Gerald Mayhew ignited the offensive spark just shy of the midway point. Zach Dorer made it a 2-0 affair to notch his first goal of the season at 13:57, followed by a pair of lamp-lighters from Czarnowczan to round out the scoring. The barrage of goals was enough to have Bemidji State yank Walsh out of net at the end of the period in favor of back-up Reid Mimmick. Business picked-up on the Beavers' offensive end in the second, beginning with a Gerbrandt power-play goal less than a minute-and-a-half in. Brad Robbins added a score at the 8:28 mark on the man-advantage to trim the lead to two, followed by another Gerbrandt goal three minutes later. Huff was able to provide Ferris State some breathing room by netting his third goal of the campaign with six minutes left until intermission. Despite a penalty-laden third period, neither squad was able to produce any goals. Motte recorded 20 saves to improve to 7-0-0 as a starter. Walsh stopped 14 of 18 shots in the first, while Mimmick denied 11 of 12 shots over the course of the final two periods. The Bulldogs (7-2-0 overall, 4-0-0 WCHA) remain at home this week, as they play host to former CCHA rival Bowling Green State on Friday and Saturday.